Have you ever had a dream so wonderful it followed you into the waking world? Do you lie awake, listening to the creaks and groans of a settling building, and believe that something strange and terrible is happening? Have you ever been unable to tell the dream from reality? 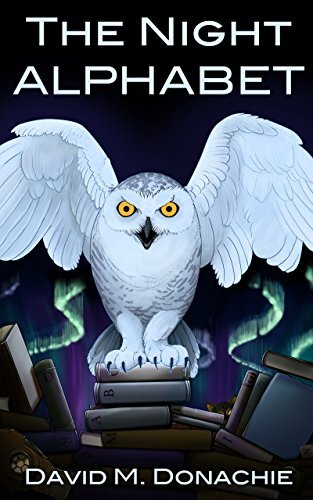 The Night Alphabet is a collection of 26 short stories dragged from the edges of sleep: marrying nightmares to detective fiction, ghosts to science, and the weird to the nonsensical. Author David Donachie weaves stories together from the ideas that cross the dozing mind, creating fantastical tales which will take you deep into the dream world and beyond. Inside you will find: cloud castles, flooded cities, haunted dreams, aliens, talking heads, insomniacs, and lots of cats. I have to say that although this is David Donachie’s debut novel it is one of the best short story novellas that I have read. 26 quirky tales of the moments captured from the brink of sleep and other times where you drift awake in night not knowing if the dream you are coming out of is real or a fragment of your deepest and darkest unconscious that is trying to escape before being pulled back. Each story getting their title from a letter of the alphabet. An A to Z of 5 minute bursts of coffee time, break time and if you dare bedtime snippets. Now the real strange thing about reading these is the familiarity of many of the tales. The only difference being that this author has carried them on. Like the times when you feel you see something move but then it is gone, well what if it wasn’t and you chased it and not only chased it but caught it! There is nothing horrid in these stories but some do leave you with that feeling of next time you experience something will you just turn over and close your eyes or look a little closer. Each of these short stories are very original and all with unpredictable endings. Not all the stories have an answer or an outcome just another direction for it to continue and make your own imagination kick into action. Some of the stories capture man at his worst while others give hope all are beautifully crafted into entertaining gems. There were memorable stories for me A is for Angels, P is for Prophecy and W is for Windblown but what I will say is there wasn’t one that I didn’t like. It is one of those books that different situations in my life are now triggering memories of different stories in this book, which is I think brilliant. It just shows how much people’s minds are connected. A real clever compilation of common awareness. Highly recommended and novellas are not very often my thing! Super read. My name is David M. Donachie. I’m a writer, masquerading as an artist, masquerading as an IT professional — which is what I actually get paid to do. I live in Edinburgh, Scotland, with my wife, two cats, and a bunch of lizards. The Night Alphabet is my first published book of fiction (I’ve had individual short stories published before, and have written a number of gaming books). The cover is appealing. Sounds interesting. I love the cover and great review. The book sounds very interesting! Hey all! David Donachie here, thanks so much for the kind comments. I drew the cover as well as writing the book. You can’t tell on a web copy (in fact it’s hard to tell even on a printed version), but the owl feathers are all actually excerpts from the book. Hi David that is quite something. What a super idea with the owl feathers. The stories are brilliant I wish you tons of success in the future. Thank you. The feathers were a silly amount of work considering that you can’t actually tell from either the e-book or printed covers. Ahh well, lesson learned!